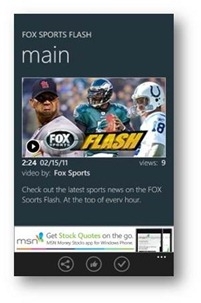 "MSN Onit, a new MSN lifestyle app tailored just for men, is now in Marketplace (download it now). Built with guys in mind, the app combines the best of men's lifestyle content from MSN and leading outlets like Esquire, Men's Health and TheSmokingJacket.com, assembling it alongside the power and convenience of Bing." The app includes integration with your e-mail, as well as facebook and Bing. If this is the sort of content you traditionally browse on your desktop, then a mobile packaging may be very convenient. Download it now from the Marketplace, and then let us know in the comments what you think it. I've got this installed on my HD7 and, while the app works and is very well made, the location services don't as they require a Zip Code, why this app is on the UK marketplace is anyones guess. Strangely enough it allowed me to log in using a UK Live ID though!! !